The Nativity story is powerfully evocative, even for those who do not profess to be Christian, despite the fact that it is almost or entirely apocryphal. For centuries the festival of Christmas, allegedly marking the birth of the Messiah, has almost seamlessly blended with parallel traditions and folklore, such as Santa Claus and Christmas trees, flying reindeer and gift-giving. Few theologians still believe that 25 December is the actual birthday of Jesus. As we will see, literalism is not at home here. The original Christian Nativity narrative is related only in the Gospels of Matthew and Luke. The two remaining canonical Gospel writers don’t mention the Nativity and Paul never refers back to it. The Christ of Paul is Christ Crucified. He shows no real interest in the life of the historical Jesus. I doubt very much that there could ever be a definitive explanation of The Procession of the Magi which could take all elements and traditions into account. Rather, this is an exploration of the theme as it has expressed itself, even before the Christian narrative. I suggest that the story itself has so much power that it can accommodate, expand and deepen several traditions that coincide in some way with Christmas. It’s as if nature itself anticipates the “return” of the Sun. Yet there are no records, either Jewish or Roman that could confirm or deny the event. Nevertheless, the story endures and is passed on even by people who have little idea of its origin. 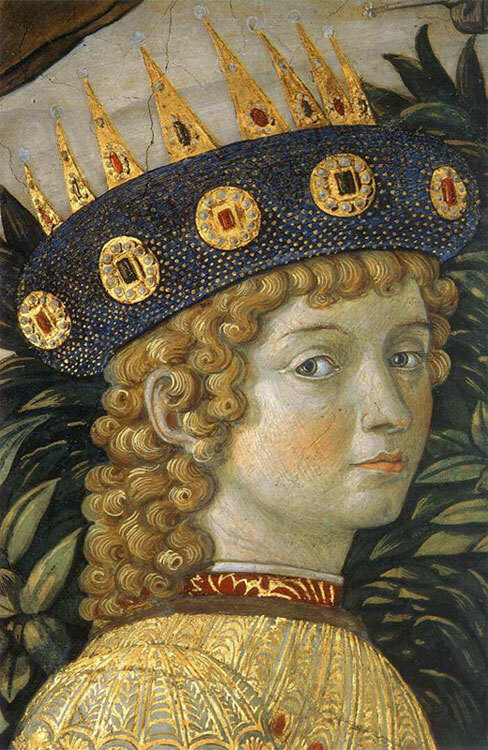 Benozzo Gozzoli, – “the Young King” (detail) Procession of the Magi. 11 And when they were come into the house, they saw the young child with Mary his mother, and fell down, and worshiped him: and when they had opened their treasures, they presented unto him gifts; gold, and frankincense and myrrh. 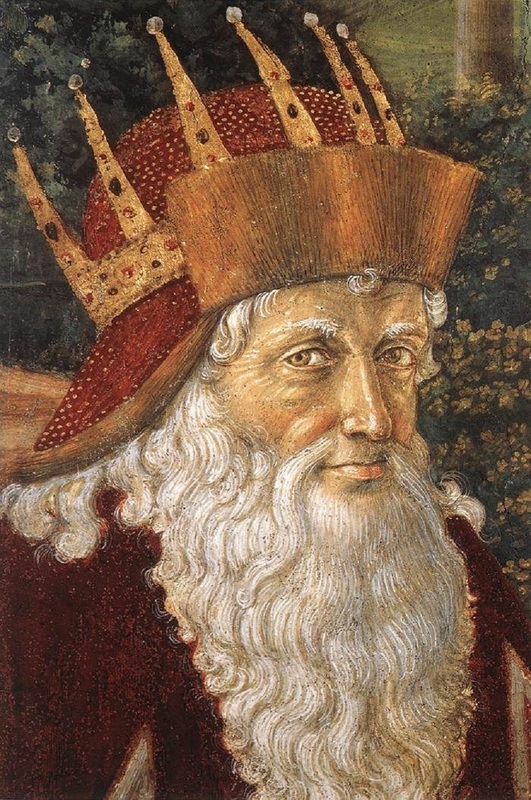 Benozzo Gozzoli, – “the old King” (detail) Procession of the Magi. The two accounts agree that Jesus was born in Bethlehem in the time of Herod the Great to a betrothed virgin whose name was Mary. There are, however, major differences. Matthew has no Census to report, no annunciation to the shepherds or a presentation in the Temple.and has him born in a house there and an unnamed angel appears to Joseph to announce the birth. In Luke there are no Magi, no flight into Egypt, or Massacre of the Innocents, Joseph is a resident of Nazareth, the birth appears to take place in an inn instead of the family home, and the angel (named as Gabriel) announces the coming birth to Mary. While it is possible that Matthew’s account might be based on Luke or Luke’s on Matthew, the majority of scholars conclude that the two are independent of each other. It’s becoming increasingly apparent that tale of the Magi may well pre-date Christianity. The inclusion of them adds another dimension and underscores the status of The Prince of Peace. This is neither plagiarism nor wishful thinking. Those with a familiarity with the Gospel of John and the work of Philo will find them speaking the same language. Philo was a Hellenized Jew and prolific author of a large body of Neo-Platonic thought, set in the context of Judaism. His work On Creation is almost certainly the immediate source of the Logos or Word, which gives us the opening of John’s Gospel. Philo wrote well before any Christian writing. John appears to be strongly influenced by Philo throughout hos own writings. Christianity and Neo-Platonism have enjoyed a harmonious relationship at the heart of much of Christian theology. 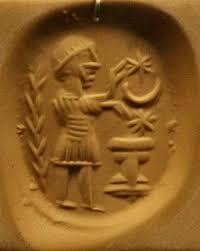 The Persian Magi were philosophers and priests. They were learned and skilled in medicine and natural science, including Astrology. They were prophets, although Christians preferred to use the term “soothsayers.” The Magian religion was Zoroastrianism. Which had greatly informed Judaism, Sorcery was forbidden. They resembled the Brahmans in function and status. Their position and role in society were very much like that of the Druids. Moreover, the number twelve has great significance. It’s the number of astrological Signs and the Apostles. It should come as no surprise that in ancient times the Sun was worshiped as a god. If there is no Sun, there is no life. The association of the Sun with life itself became spiritualized, perhaps we should say internalized – a guiding light. We are in fact made of stardust. The Solstice is an astronomical event with major implications for life on Earth. By the time of the European Renaissance, the Magi are invariably portrayed in the finery one might expect of a courtier. It became common to portray the Magi as representing the three stages of life. In fact what we find over the centuries is a practice of applying ever more meaning, as if projected upon them. This is surely the intent and the effect is to create a Universal story, with clear roots in the Solar Mithraism and Zoroastrianism expressed through Christian mysticism. The favoring of evocation over definition is part of the nexus. 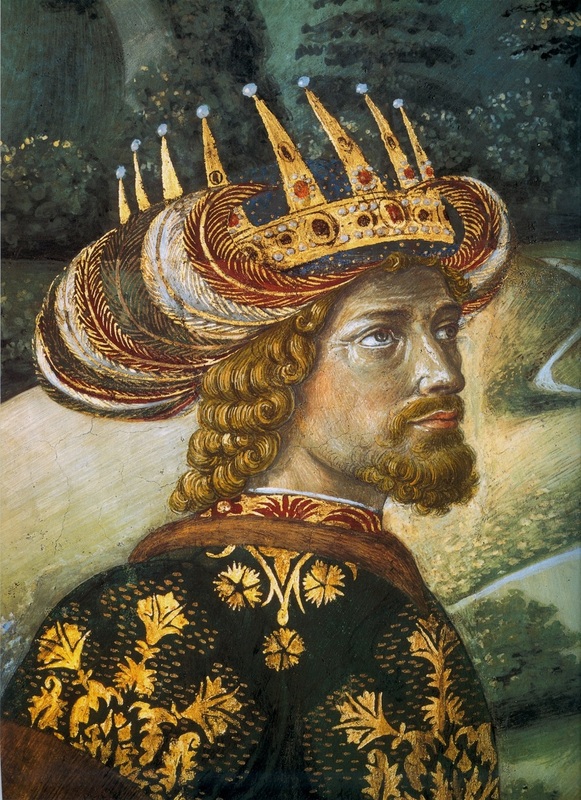 The “three kings” have also been associated with the three bright stars in Orion’s belt. Depending on your point of view, this either confuses or enriches the story. The “Three Kings” illustrated here is part of a much grander design in the “Chapel of the Magi” commissioned by the elder Cosimo and the family has been insinuated into the paintings, creating the sense that the Magi and the Medicis are part of the same story. The artist has included the three sisters of Lorenzo which offers up the idea that the Procession or Adoration of the Magi is a Universal, one in which we all share in one way or another. Our culture will determine the details and some may never understand the mystical significance. It would be a mistake to insist on literalism or historicity. Similarly, it is not at all out of the question that the Three Kings are related to the Trinity in the Renaissance Magi, but in the sense of one to adore each Person of the Trinity. These kinds of associations were in congruence with the syncretic philosophy of Marsilio Ficino, a Catholic Priest who was also a Magus, translator of the Hermetica and almost all the works of Plato. His magnum opus was his Theologia Platonica. They were also at home in the antiquity of India, Persia, Egypt and other rich cultures who, to a greater or lesser extent, informed each other. The origin of the word Magi is Persian. They are astrologers and sages. not kings. 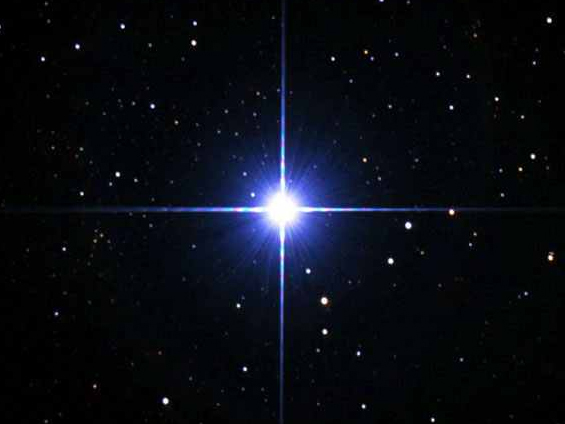 The star in the East was almost certainly Sirius. The coincidence with the Winter Solstice is no accident. What we have is a Solar festival, but also a mystical vision. The Epiphany and the Procession of the Magi are not just something that happened more than two thousand years ago. If that were the case, the story would have little relevance. They were perhaps not so much following a star as acknowledging and venerating a great light that drew them to an epiphany. We can associate it of course with the Winter Solstice, the longest night followed by the waxing of the light. The Yule log, the lighting of candles and merry-making seem to fit seamlessly into the story. In Polish tradition, the “star of Bethlehem” is the first star seen to rise on Christmas Eve. Gwiazdka is a symbol of the “Star of Bethlehem, whose appearance was accompanied by the birth of Jesus. Thanks to the Star of Bethlehem, the Magi could reach the place of birth of the Savior. Today, we expect the first star, which appears in the Christmas sky during Christmas Eve (Wigilia). Only after it shines, Poles sit at the table, divide the wafer and exchange Christmas greetings.” ( see Polish Toledo) The spirit of Christmas takes precedence over identifying a particular star. Literalism misses the point. The Epiphany and the Procession of the Magi are not just something that happened more than two thousand years ago. If that were the case, the story would have little relevance. They were not so much following a star as seeing a great light that drew them to an epiphany. We can read the event as a Solar pilgrimage and celebration that includes a rich tapestry of related traditions, with sources reaching back to remote antiquity. 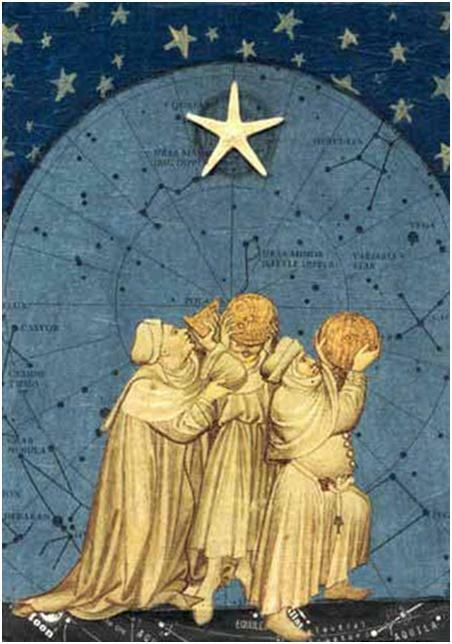 Ficino is most eloquent on this point: that the Magi were embraced in the same way that the Academy of Florence had embraced Hermes Trismegistus, Zoroaster, Orpheus, Pythagoras and of course, Plato. Ficino accepted that all these sages had drunk from the same well of the prisca thelogia. He often referred to the Nativity in his writings, particularly in his letters and in the Apologia. He had a life-long fascination with the Magi. Just as the Zoroastrian is not worshipping fire. The flame is an outer manifestation of an inner state of being. We are drawn to the light in many ways and in many vessels. In Part II of this article, I will examine the astronomy and astrology of the event as seen from 7BC. This Sumerian bas-relief evokes most of the core themes of the Magian pilgrimage with which we are familiar. In this case, there are Four gods standing before the Tree of Life with a Winged Solar Disk above them, which is the symbol of Zoroastrianism. This is very much an introductory piece, but it has some great footage and manages to cover a lot of ground. Be sure to watch Part 2 as well.